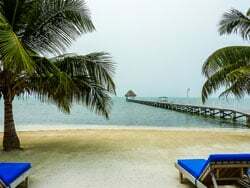 Two years ago Duane and Judy Allen moved full-time from Tampa, Florida, to Ambergris Caye, Belize. Duane started checking out the island’s beachfront property and found that it was still affordable. In 1999 the Allens snapped up a stunning beachfront lot south of town, in an undeveloped area. They weren’t yet thinking about retirement. But since Judy’s sister’s family was already living on the island, the Allens moved up their schedule and built their house in 2004. Judy’s sister and family live in the downstairs unit. The Allens live upstairs. At first they came for vacations, before finally retiring full-time. Judy keeps busy working around the house and yard, keeping Duane stocked with supplies, and staying in touch with friends and family in the States via computer. She takes regular jaunts into San Pedro with her sister or friends, for lunch and shopping. The Allens have a comfortable mix of expat and Belizean friends. “We go out for dinner two or three times a month. Sometimes we go to Fido’s on Monday nights to eat out and listen to Dennis Wolfe and his band. I also host a pretty cut-throat Scrabble game with girlfriends and my sister every other Sunday,” says Judy. 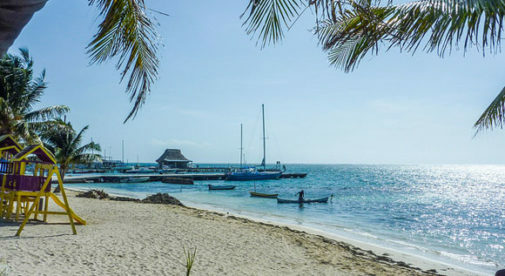 Ambergris Caye offers breathtaking views and beachfront property that is still affordable. To date the couple is pleased with the health care in Belize. Like many expats, they pay out of pocket for medical expenses, which are reasonable in Belize and Mexico. Duane recently had two molars extracted for $30. Judy paid $40 each to have four fillings replaced, and $200 to replace a crown. Both Allens signed up for Social Security early, when they turned 62. They also receive income from annuities. All told, their monthly costs amount to around $1,300 (excluding medical expenses). Like many expats in San Pedro, the Allens are avid animal lovers. Judy volunteers for the Saga Humane Society. She and her sister plan to spend more time volunteering for Saga this year. Duane is very content living on his pristine beach, working on his art pieces and projects. He seldom leaves the island. But Judy returns to Florida or Georgia four or five times a year to see family and friends. After all, it’s a short two-hour flight.